India defeated Netherlands on a slow and low track at the Feroz Shah Kotla with nearly 14 overs and 5 wickets to spare though the margin of victory don't reflect the correct picture of poor Indian batting. The Indian bowling was just about tight against some weak Netherlands batting and Indian top-order had no clue against the left-arm spin of Peter Seelar. Chasing 190, India raced out of the blocks with Sachin Tendulkar becoming the first man to reach 2000 World Cup runs with a hat-trick of boundaries in the fifth over, and Virender Sehwag backing that with three more fours. The flurry of boundaries had the Delhi crowd on their feet and cheering, and when Sehwag struck Seelaar over extra cover for six and then dabbed him to third man for four. Seelaar, though, ensured it wasn't another embarrassingly one-sided match, like many of those involving the Associates in this tournament. He dismissed Shewag, Tendulkar and Yusuf Pathan who was promoted to No.3 in a quick succession and created little panic in Indian camp. Virat Kohli didn't last too long before being bowled by Peter Borren, but Gautam Gambhir and Yuvraj Singh steadied the innings as Netherlands' limited bowling struggled to make more inroads. They added 40 trouble-free runs before Gambhir was bowled round his legs. It was left to Yuvraj and MS Dhoni, India's finishers over the past few years, to calmly steer India to victory with a 61-run stand, with Yuvraj getting his third half-century in a row. India would have had a tougher test had it not been for a Netherlands middle-order collapse, which was sandwiched by a solid start and a flourish at the end. On choosing to bat, Eric Szwarczynski, playing his first match of the tournament, combined well with Wesley Barresi to put on 56, equalling Netherlands' best opening partnership in World Cups. There were only six boundaries in the first two Powerplays but aside from a couple of half-chances, it was easy going for Netherlands. Piyush Chawla, surprisingly retained after a horror match against Ireland, finally got the breakthrough in the 16th over with his favourite weapon, the googly, which bowled Szwarczynski after he read it too late. The next dismissal came from the most impressive bowler in the Ireland game, Yuvraj, whose wicket-to-wicket bowling got Barresi lbw. Chawla started well in this match but once again looked out of sorts when he was hit badly later in the match. Tom Cooper and Ryan ten Doeschate, two batsmen with career averages in the mid-60s, thwarted India for 10 overs, surviving two tough caught-and-bowled chances but dispatching the odd loose ball served up to put on 35. Netherlands were 99 for 2 after 29, not quite top gear, but the platform was in place for some big hits later on. It wasn't to be though, as both batsmen were dismissed in successive overs to spark a collapse that cost them 5 for 28. There were a couple of avoidable run-outs as well, but the dismissal that was most embarrassing for Netherlands was Alexei Kervesee's; he swiped a long hop from Chawla, expertly picking out Harbhajan Singh at deep midwicket. The win puts India top of the table and virtually sailed in to the quarter-finals with only South Africa and West Indies remaining in the league phase before the knockouts. Today Sri Lanka will take on Zimbabwe in Pallekele. This match is very important from Sri Lanka's perspective as win in this game will take them in to the quarter-finals. Sri Lanka suffered badly in this tournament with loss against Pakistan which nobody expected and their match against Australia washed out due to rain which forced them to share points with Australia. Today's match can be a cake-walk for them but Cricket is very funny game and anything can happen atleast in the shorter version of the game. 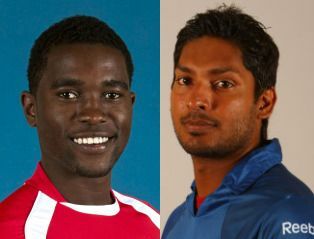 Lankan team's morale must be down with the news of Dilshan's doping test which found negative according to Lankan media. There is a feeling that Sri Lanka haven't quite clicked yet. They have eased past Canada and Kenya - the latter thanks to Lasith Malinga's hat-trick - but came unstuck against Pakistan with an 11-run defeat. The clash against Australia was shaping up to be a cracker when the rain came and interrupted a well-paced innings by Kumar Sangakkara and denied the spinners their chance to shine. Zimbabwe shouldn't provide many problems having suffered a 10-wicket hammering at the hands of New Zealand in their last game. Their batting has lacked consistency and will face a tough examination from whichever combination of spinners Sri Lanka opt to field, while there's Malinga's toe-crushes to overcome as well. Ray Price and Prosper Utseya are good spinners themselves but desperately need the batsmen to back them up. of plagorism or copyright violation? My website has a lot of completely unique content I've either written myself or outsourced but it appears a lot of it is popping it up all over the internet without my agreement. Do you know any ways to help reduce content from being ripped off? I'd truly appreciate it. on other sites? I have a blog based upon on the same information you discuss and would love to have you share some stories/information. I know my readers would enjoy your work. If you're even remotely interested, feel free to shoot me an e mail. Greetings from Florida! I'm bored to tears at work so I decided to check out your site on my iphone during lunch break. I love the information you provide here and can't wait to take a look when I get home. post for you. Here is my personal email: corydeloach@gawab. com. Be sure to contact me if you're even slightly interested. Many thanks. Your ѕtyle іs verу uniquе comрared to other folκs I've read stuff from. I appreciate you for posting when you have the opportunity, Guess I'll just book mark this wеb site.